Another hellish night, coughing for two hours solid before the mucous retreated and allowed me to sleep. This cough is really winding me up now, so much so that I’ve actually gone out and bought some cough medicine, something I rarely do. I hate cough medicine with a vengeance, and always have done. I put it down to Benylin giving me hallucinations when I was little. Anyway, I succumbed, and bought some Covonia Bronchial Balsam as advised by the pharmacist. Tastes utterly disgusting and has had precisely no effect whatsoever. Another bad night ahead of me tonight then. Lovely. 22. Edit up someone’s script that I promised to edit up. I don’t know what’s happened to my motivation. A few months ago I was all eager beaver every morning, getting up, doing my Pilates, ready and raring to go by 9am every morning. Now I don’t even have the alarm clock on, haven’t done any Pilates for weeks, and frankly feel like curling up in a small ball and hiding under the sofa with the dust bunnies for the rest of my natural life. I’ve been persuaded to go back to Dorset tomorrow, partly to see the Bank Manager and discuss what the hell’s going on with the business (oh, joy, I really look forward to that one), partly to be present at a family party on Saturday (oh, joy, I get to make potato salad, I really look forward to that one) and partly to recuperate from this lurgey that’s had me in its grip for the last week and a half (actually, I do look forward to that one). Part of me wants to go – Fflwff’s still down in Dorset and I do miss her horribly. Every day I look round to see what she’s up to and she’s not here to be up to anything. Seems silly to bring her back here, though, when I’d only have to move her again in three weeks time. The rest of me just wants to stay here and continue to fail to get on with stuff. I love Pirates of the Caribbean. I love the way that Johnny Depp becomes Keith Richards The Pirate, mad glint in his eye and only still upright by accident. And I love the fact that there’s not a single American accent in the whole film, despite it being based on a Disney ride. So I did a search on Zoetrope (yep, still faffing) and found a couple of threads that I’d previously missed about the film which were interesting. One of them had a link to Wordplay, the web site of Ted Elliott & Terry Rossio, who wrote the script to Pirates. Whilst exploring WordPlayer, I discover a link to a page about a movie adaptation of Neil Gaiman’s Sandman. LOG LINE: Sandman, the King of Dreams, is captured and held prisoner. In his absence a nightmare escapes from the Land of Dream into the waking world. Sandman must recover his stolen tools of power and defeat the nightmare in order to regain his kingdom. Now Sandman is a work of genius in my very humble opinion. It is not a work that should be trifled with. So having been impressed with Pirates I felt quite excited to discover that the same perpetrators had been working on Sandman. Then I read further, and was disappointed to find out that this script is not only five years old, but that it doesn’t much look like it’s going to see the light of day as is anyway. Oh dear. Warner Bros. really do have their heads stuck in their lower intestines, don’t they? Ok, I know as an aspiring screenwriter I shouldn’t be caught dead criticising such luminaries (please, excuse me whilst I stop guffawing), but please. Someone find them a surgeon. Every year, on May Day, a young woman is stolen away by the faeries to become their Queen for a year. This year, though, the faeries have bitten off more than they can chew. Shakti Nayar will do whatever it takes to get her own life as a botanist back. As she struggles to work out how to get home, she uncovers Faerie’s dark secret and finds that she is not the only human who needs saving. All the threads looked the same to the innocent eye, but Maude could see the black heart running up through one strand as it wove its way through the lace roundel. She busied herself with tidying her bobbins as a customer browsed the lace mats on her stall. “I’ll take this one,” the woman said, holding up a square piece, twelve inches across. Maude winced, picked up the piece she had just completed and held it out to the woman for her consideration. Matt is fascinated by the story of Argleton, the unreal town that appeared on GeoMaps but which doesn’t actually exist. When he and his friend and flatmate Charlie are standing at the exact longitude and latitude that defines Argleton, Matt sets in motion a chain of events that will take him places he didn’t know existed… and which perhaps don’t. For all my latest writing and bookbinding news join up to my monthly(-ish) newsletter! 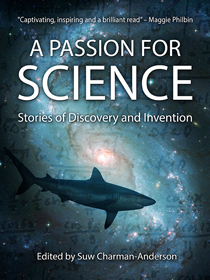 From the identification of the Horsehead Nebula to the creation of the computer program, from the development of in vitro fertilisation to the detection of pulsars, A Passion for Science: Stories of Discovery and Invention brings together inspiring stories of how we achieved some of the most important breakthroughs in science and technology. Suw on C17: Day 151 – How am I doing so far? Ridley Kemp on C17: Day 151 – How am I doing so far? Can the ‘Wisdom of the Crowd’ fix disinformation? Can US Public Media Buying News Startups Stem the Crisis in Local Journalism?